Prime Time: How it Works. Direct home exchange: Log into your secure member’s area, look though all the exclusive properties around the world, make contact with other owners via secure messaging, and start home swapping! Credit trades to travel: Home exchange with credits is simple and works best for those who have more than one property. You earn credits when another member stays in your property; you then use those credits to stay in any other members' property. For example, you let Kate stay in your villa in the Caribbean. With the credits you earn, you stay in Will's ski chalet in Colorado and Will goes to Sara’s condo in Thailand, and so on.. Your home exchange / trade property has a credit value based on its potential Weekly Vacation Rental Value. The property does not need to be a rental home. $10,000= 100 credits and so on. The number of credits needed is listed on each property page. This is for 7 nights accommodation unless otherwise stated in the property details. When there is a range of credits, this is usually based on seasonality or number of guests. For specific information please read the property page description or contact the International Vacation Home Exchange travel coordinator team. Earning extra credits: Introduce us to new members and receive up to 5 free credits per referral (worth $500 of vacation time) and your friend (new person joining) will also receive up to 5 free credits. As an added bonus, when your friend (referral) trades the first time, you will also get another 50% of that trade's credit value. Hear from our IVHE members. Saving money on accommodation costs is just one of the many benefits of joining IVHE. Love home swapping? Try it with IVHE home exchange and start saving straight away. You rent your vacation property, so why home exchange too? You can do both. Almost all vacation homes have vacancies. Turn those vacancies into valuable IVHE Credits that you can enjoy using around the world. You can still continue to rent out your property, but by also listing in IVHE, you can earn credits for weeks not rented. Remember with IVHE you get the full value as if renting, allowing you to choose and visit new vacation locations. With IVHE's unique Prime Time offer, you are guaranteed to receive credits, just like a rental booking, but with no chance of a cancellation. This is an ideal option for you to start planning your next vacation with IVHE now. If you have a rental cancellation, try lising your property on our Last Minute Availability promotions. If you have a holiday villa, hotel, cottage, yacht, lodge, cabin or any type of vacation rental and like travelling yourself, then our home exchange credits system can give you more value than your vacation rental income. IVHE gives you the option of turning your one property into hundreds while saving you money. Log into your members area. Have a look at the stunning IVHE Home Exchange members' properties, find a property you would like to visit, and submit a Trade Request or a Direct Swap request. For Trades: Your personal trade coordinator will contact the owner to see if it is available for the time requested. We do all the work for you! Once a suitable property is found, you and the owner confirm the trade and we will send both IVHE Home Exchange members a trade agreement. The host signs it first then it will come to you. You then have up to 7 days to finalise travel arrangements before having to sign the agreement. The host has already agreed. When making a credit trade, effective 15th January 2015, the Arrangement Fee is only 9% of the value. Example, if using 20 credits (valued at $2,000) for a trade, the Arrangement Fee is only $180, still saving you 91%, or in this case $1,820! The minimum amount for an Arrangement Fee is only US$ 95. For a Direct Swap: Use the direct home swap box in your members area to send them a message. It's that simple! If you would like the same personal service as for a credits trade, let us know, the process and fee are the same. 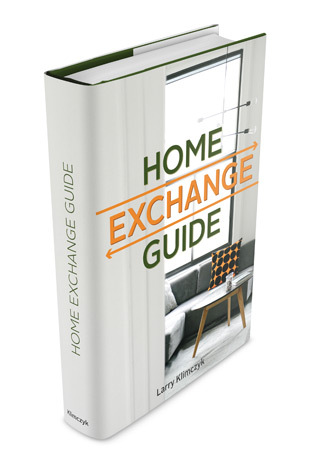 Join IVHE Home Exchange today! Prime Time - start traveling now! Prime Time is great for travelers and hosts. Hosts immediately gain more credits for your next vacation. Use IVHE Prime Time by blocking out one or two weeks* during sought after vacation times at your property for other IVHE members to visit. You keep those weeks available so others can immediately book the dates. Those weeks will show on IVHE's Prime Time availabilities making it easy for other members to see properties that are available. As soon as you allocate the weeks and they are approved, you get the full credits straight away. That way you do not have to wait for a trade to happen on your property before you can start travelling yourself. Travelers, thinking about your next vacation and would like to lock in some dates? Search through our IVHE Prime Time offers and you can instantly confirm your next travels. All of these properties have dedicated time exclusively for you, an IVHE Member, thus allowing you to quickly set up your next vacation. Remember, when you dedicate one or more weeks to IVHE you will instantly gain credits, so this is a great way to build up your opportunity for more travel. *For full details, view section 8 and 9 of the IVHE Terms and Conditions. Three-bedroom home swap with pool and spa in The Valley of the Sun -- The greater metropolitan area of Phoenix, Arizona -- America’s sixth largest city -- encompasses 2,000 square miles in “The Valley of the Sun” and more than 20 incorporated cities. One of these cities is Surprise, Arizona, 20 miles northwest of Phoenix. The Valley of the Sun is in the Sonoran Desert, defined by its classic western landscape of red-rock buttes and majestic saquaro cactus. The sun shines here 85 percent of the time. With annual rainfall of 7.7 inches, it is one of the greenest deserts in North America. Surprise got its name from one of its lady founders in 1938, who famously remarked that she would be surprised if it ever amounted to much. Today its population is over 100,000 with a world of activities within easy range -- a major tennis center, an acquatic center, a 37-acre park with an urban fishing lake, 26 public golf courses, the White Tank Mountains with 25 miles of hiking and biking trails, a shopping and entertainment mall with both an NFL stadium and an NHL arena; and, of course, Phoenix and its museums, major league sports, outstanding restaurants, night life, and cultural attractions. Your house in Surprise is made for casual outdoor living around the pool, spa, waterfall and BBQ grill. Indoors, the niceties are non-stop. The bedrooms are cozy with refined, sophisticated décor, and located in separate wings for privacy. The dining room features a handmade copper table and seating for six. The living room highlights comfortable furniture and state-of-the-art entertainment electronics. The fully-equipped kitchen has slab granite counters, stainless steel appliances, and even a frozen-margarita maker – something no home in Arizona should be without. This house, set in timeless Southwestern scenery and accessible to so much, is perfect for family vacations, weekend adventures, romantic getaways, or snow-bird escapes. Find out more about it by clicking the link above. If you are not a member of the Internatonal Vacation Home Exchange and would like to learn how joining can save you thousands in vacation accomodations, visit us at www.ivhe.com.